Since my post about this remarkable couple in November 2008 I am none the wiser about their fortune. What happened to Safoura Denou and her husband Seny Sangaré? Are they still living in San, in the Ségou region of Mali? Are they alive? Do they still perform? As representatives of the authentic bambara culture of the Segou region they deserve a place in the Hall of Fame of Malian music. And to support this I would like to submit this cassette as evidence. Recorded in 1988, it is indisputable proof of their greatness. Both Seny's ngoni playing and animation and Safoura's at times almost violent vocal contribution in this cassette will be very hard to match, just on these qualities. But in addition to these they demonstrate a profound knowledge of the tradition of their region in their songs. Their version of "Mbaoudi", for example, (not on this cassette, but on one which I'll post later) has become a standard in Malian music. It was even parodied by Habib Dembelé a.k.a. Guimba, Mali's most famous comedian, and his wife Fantani Touré. "Formed in 1964 the Nuta Jazz Band was one of the first to be formed under the new state-controlled regime. The acronym 'Nuta' actually stands for the band owners, National Union of Tanzania, head organization of the trade unions. The band was formed as their parent organization's entertainment wing, band members being regularly employed workers, paid monthly wages, housing, health care, etc. 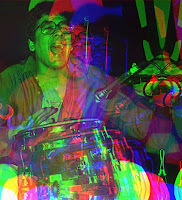 Nuta Jazz became the model for many bands to be formed in 1970s, the band itself went though different incarnations: Following name changes of their parent organization they became Juwata Jazz in 1978, and Ottu Jazz in the early 1990s. In recent years the band has become independent and is now lead by Muhiddin Maalim, one of the founder members. It is now just called Msondo Ngoma, after their mtindo (dance style) of many years. Among all the orchestras and musicians featured on this recording it is the sole surviving band, still active on the Dar es Salaam dance hall circuit in 2007." Text and photo borrowed from "Zanzibara 3: Ujamaa" (highly recommended). I was going to share this with you as a podcast, but I decided to 'promote' it to a real post. They died within months of each other and I can't hear the one without thinking of the other: Baba 'Grazy' Sangaré and Ray Barretto. I think I don't need to introduce the latter (but just in case: link, and I'm sure it won't be hard to find others). Ray Barretto died in February 2006, and Baba Sangaré, legendary presenter of Radio Mali, in August 2005. Baba Sangaré featured in the documentary about Malian music in the UK series "Under African Skies", but was already well-known as a enthousiastic radio personality and promoter of latin and Cuban music in Mali. And if you like radio shows from Africa, I strongly advise you to visit the website of Lolaradio, where you can find some brilliant (and at times historic) selections recorded in not only Mali, but also in Tanzania, Ethiopia, Ghana, Surinam and other countries. Just one EP in this post, I'm afraid. But there are still four songs by Kongo Jazz on this record, and that's two more than on the EP I posted earlier. On side two there are two songs composed by a certain Bejos, both featuring a harmonica (which may suggest that there is a link between Bejos and the harmonica..). The first of these is an instrumental track. Although I have no confirmation of this, it appears to me that one of the two singers in these songs is Lola Djangi 'Chécain', who started his musical career in 1957, in a band called Micra Jazz, alongside Simaro and Raymond Brainck while still at school. They went on to form Kongo Jazz (named after Kongo Georges, the owner of the bar where they performed, and where the O.K. Jazz had performed before them) in 1957, and were signed on to the Esengo label in 1960. At the Esengo label he met Nino Malapet and Rock-a-Mambo, and Dewayon and his Conga Jazz, which bands he joined before switching over to the O.K. Jazz in 1967. 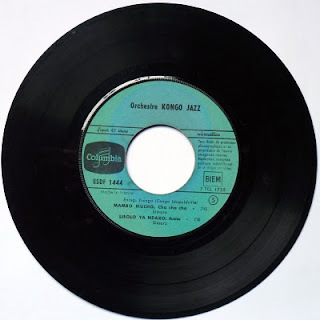 Kongo Jazz recorded quite a few tracks at the Esengo label. Chronologically the two Simaro tracks were originally released after the two tracks in my earlier post. Of the two Bejos compositions I have no idea when they were released. The interviews with Simaro and Chécain can be found here. For some time now I am slightly disturbed by the lack of interest by the western music 'industry'* in the music of Burkina Faso. And not just because of my hero Amadou Balaké, but certainly also because of deserving bands like the Dafra Star, who are the subject of this post. The star of Dafra Star is singer Tidiani Coulibaly, who - I am told - was quite a celebrity in the Upper Volta of the 1970s. Coulibaly started Dafra Star in 1975 after having left the famous Volta Jazz orchestra. A year later, in 1976, his new group won first prize in the national Festival of Modern Music, with the song which is featured on the A-side of this lp. The song, which on the album is simple called "Recital", is another example of a track in the "Regard Sur Le Passé" style 'invented' and/or made famous by Bembeya Jazz. 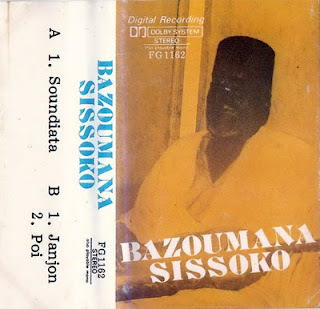 The horn section and the whole sound of this track remind me strongly of Super Biton from Ségou, but this is not surprising: the songs were recorded at Radio Mali by Boubacar Traoré (who also recorded Biton, - and many many many others). The link to Mali and Biton does not end there. 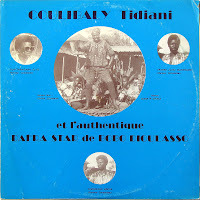 The guitarist on the left of Tidiani Coulibaly (in the photo) is none other than Zoumana Diarra, who in the 1980s went on to play with Super Biton, Rail Band and Super Djata, and who also performed on that great cassette of Coumba Sidibé. Zou has been living in the Netherlands for the last twenty years. Side two contains five great songs which others probably would describe as "influenced by Cuban music" or - worse still - "Afro funk". I prefer "authentically voltaique" - but certainly with bambara influences. When Bazoumana Sissoko died on December 27, 1987, the myths surrounding this legend of Malian culture neither started nor ended. Even his birth is surrounded with myth. He is said to have been born on the day the French general Archinard took the town of Segou (this historical event took place on April 6, 1890), - according to some in Koni in the Tamani cercle of the Segou region, and to others in Seguela which nowadays is in the Koulikoro region (but at the time was also part of the Segou empire). Not only born blind, but also a paralytic from a young age, he nevertheless grew to a monumental status in Malian society, earning him the nickname of Le Vieux Lion. As a Sissoko he was born to become a griot of the nobility, and this destiny he took very seriously. He is a classic example of a traditional griot, and as such refused to 'sell out' praises to anyone. Instead he studied the extensive range of legends and myths of Segou and the bambara epic, using the examples of the heroes of these legends to praise positive human qualities. His limitations he turned into an advantage, by studying the ngoni and becoming the undisputed and inimitable master of this instrument. He lived through the degradation of the colonial era, through two world wars, experienced the struggle for - and subsequent joy of - independance. At the end of the colonial era, in 1952, he was one of the first 'native' artists to be recorded by Radio Soudan, when he accompanied Koni Coumaré. In the first decade of Mali's independance Bazoumana evolved to the status of national monument, not just by writing the music of the national anthem of the new state (the lyrics were written by Seydou Badian Kouyaté), but also by his contribution to each and every national event. Very soon in hearing Bazoumana on Radio Mali Malians knew that an important event had taken place or was taking place, whether it was a day of national celebration or of national mourning. After the military coup d'état in 1968, led by 'Balla' Moussa Traoré, Bazoumana was rarely seen (although his music was still heard on the radio). 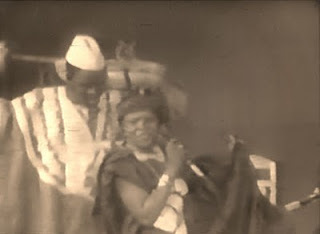 A passage in one of his rare songs from this era where he sings that a griot can not serve two masters (jatigui) is interpreted as an explanation for his absence from the 'limelight'. His withdrawal from public life after 1968 did not result in Bazoumana fading from the memories of the Malian people. Instead the myth surrounding Bazoumana grew. It was said that in the heat of a performance he had put his beloved ngoni aside,and the instrument had continued playing on his own*. Even today you can still hear stories (or myths) about Bazoumanaba and his magic ngoni. When Bazoumana died in 1987, it was said that one of the legendary balanzan trees, which stand at the entrance of the town of Segou and which are symbols of Segou's status as a former empire and craddle of bambara culture, had fallen. * this was actually confirmed to me by (people who I consider to be) very reliable and down-to-earth witnesses. This is a runner-up in the Worst Sleeve competition, and not just because of the cheap colours. Of course Polydor Kenya has a reputation to uphold in this field, with a long line of cheap looking album covers. In this case the cheapness is aggravated by the apparent incorrectness of the information. I mean, "8 originalhits"? Do they mean over the two volumes (there is also a volume 1*)? Or are they referring to the fact that these tracks were originally released as singles with part one on side A and part two on B (and I am not suggesting this was the case)? Luckily the exterior lack of quality is generously compensated by the quality of the musical offerings. Four top tracks by top artists, from East ánd Central Africa. 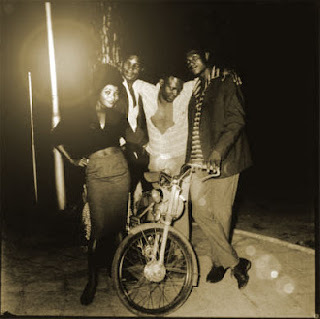 All tracks are in that rich, guitar-based East African 'rumba' style, - but this doesn't mean that there is no variety. The album opens with "Mwenda Pole", a laid-back classic by Wilson Peter and Simba Wanyika. By contrast the second track, "Mabibi Za Watu" by the great Moreno Matamba and Moja One is nervous and charged with a dramatic tension. 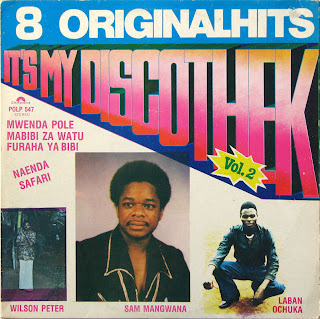 Side two opens with Sam Mangwana, who although singing in swahili manages to remain one hundred percent himself: a master entertainer. My guess is that "Furaha Ya Bibi" was recorded in the same session as "Masai" on "Kweya" (which was released in the same year). 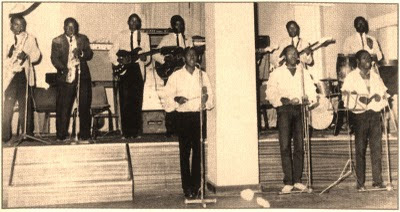 The album is rounded off by a song by Laban Ochuka and the Maroon Commandos. Their "Naenda Safari" has a determined pace befitting a band with military roots. *which in my opinion is not as good as this second volume. But, if you like, I will post this later. To tell you the truth, I am not quite sure when or where I recorded these three records. And if I remember correctly I didn't find out the titles and the performing artists until some years later. The records were probably released in Léopoldville, Congo, on the Esengo label, and presumably in the late 1950s. Clues for this can be found in the repertoire, which clearly contain elements of other popular groups from that glorious era. Apart from this I know very little about the Affront Jazz or its members De Bockout, Monteiro and Baguette. Nevertheless these six songs are firmly rooted in my musical memory and bits of these tracks surface at the most awkward moments. Especially the Rock-a-Mambo like beginning of "Soriano Me Voy" has a tendency to pop up in my mind in boring meetings, or queues in the supermarket. The first two of these tracks have been blatantly inspired by Franco and his O.K. Jazz. I mean, how blatant can you get, with a title like "Marie Pauline" (a mix between Franco's first girl friend Marie José and his first wife Pauline), the Franco-Essous inspired guitar-clarinet runs and the Rossignol-like vocal. For the other four songs Affront Jazz have listened carefully to the groups from what was probably their own label: Rock-a-Mambo and African Jazz. I wouldn't even be surprised if it turned out that members of these orchestras were playing in these songs. "La Gayophona" on the other hand was also performed on the Loningisa label (early 1958), where Pholidor claimed to have written it. I have, however, been assured that African Jazz also performed the song. I hope someone can enlighten us with more information about these delightful songs. 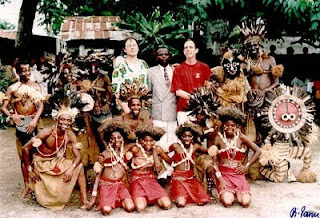 Before you listen to a note of the music I am sharing with you in this post, I would strongly recommend you read this article on the Afropop.org website, in which Crammed Discs' Vincent Kenis explains how he became involved with Konono No.1 and started the Congotronics series. One of the things that attracted me to African music in general was the fact that it was different. In the late 1970s, when I started looking for 'something else', I soon found that there was plenty of that in Congo (or Zaïre as the country was called at the time). As Vincent Kenis states: "...Congo is as big as a continent. You can listen to one different style of music every day for a whole life without relying on foreign music." 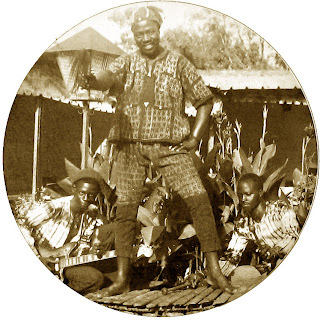 Kenis and his friend Tony Van der Eecken* have over the years dug up (good), and recorded (even better), a variety of brilliant modern traditional music styles from Congo and have as a result contributed to the preservation and revaluation of this music. Luckily they also appear to be very aware of the risk (or downside) of inviting these musicians to perform for western audiences. Vincent: "You talk about spirituality in the music. I don't think a group like Konono when it plays in front of a Dutch audience—which is really nice; I mean, it's a nice surprise for the audience, but I don't think you get the same kind of spirituality. They want to show off because they're like Martians. They are aliens, and they start acting like aliens. And they lose a part of the music that is very strong, and very reflective, and very progressive." Even after all these years of listening to African music I can still get very sad when I hear people (especially in the western media) referring to this music as "African rock 'n roll" or "African punk". Konono's leader Mawangu Mingiedi: "When I first came to Kinshasa, I started playing my songs at funerals, the last day of funerals, when people were mourning, on the last day of mourning. During a funeral, we play a lot of songs that are love related, because the departed one needs to be consoled. So to get him or her, or the family, away from sorrows, we bring love to the person. We do a lot of songs related to that, and also songs to help them to be welcome to the world of the ancestors." My first (conscious**) exposure to the music of Konono was listening to two cassettes ("coffret 2 cassettes") released on the Ocora label in 1986. The article I mentioned earlier states that this album was released in 1987, but this is a misconception: the CD was released in 1987. But given the choice between the CD and the cassettes, I would certainly opt for the 'coffret'. It has, like the CD, four tracks, but all of the tracks are longer, and in two cases even much longer. On the cassettes all four tracks are almost 30 minutes, while on the CD the tracks are cut short at a sorry 14'28, a disappointing 26'51, a dramatic 9'31 and an incomprehensible 23'00. Personally I am stupified by the shortening of the track by the orchestre Bambala by over 20 minutes. Their 'animation Kifuti' accordeon (extra points!!) 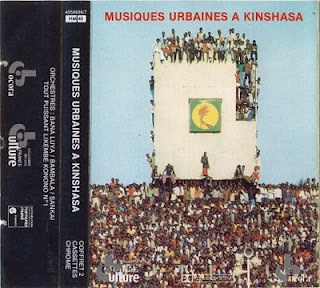 masterpiece, recorded one evening in 1978 in the Ngaba area of Kinshasa, really gets going after ten minutes, but on the CD it never gets there. And Ocora have waved the warning of orchestre Sankaï (from Mbuji Mayi) not to intervene in other people's business ("il ne faut pas intervenir dans un affaire d'autrui") and have removed 15 minutes of their track. Orchestre 'Tout Puissant' Likembe Konono No.1, at the time led by Nzu-Nlaza, saw their song almost intact, with only 3 minutes gone. And is it my imagination, or is the distortion of the amplified likembes 'toned down' or softened on the CD? A distortion for which Konono even in 1978 used a pedal, by the way. Does anyone know what the relation is between said Nzu-Nlaza and Konono's present chef Mawangu Mingiedi? I am curious, because in the Afropop article Mingiedi seems to suggest it was 'his' group from the start. I think I can safely say that in this case cassette wins over CD. * and if you like the music of these cassettes do yourself an enormous favour and check out these absolutely fantastic radio programmes from 1991 (repeated in 2006) and 2006 which you can still listen to on the website of "De Wandelende Tak". Both programmes feature recordings made by Tony Van der Eecken and Vincent Kenis. And if you can't get enough there is more on that website, also from Tony Van der Eecken; but older streams are in a pre-broadband bitrate. The programmes are in Dutch, but for those interested in the music this should be the least of their worries. Personally I get more disturbed by the realisation that there is so much more incredible music from just one country. ** and I add this because a lot of traditional music has been released without a proper identification of the musicians performing. The new year has started in a slow pace. In many parts of Europe snow has clogged up traffic. Even in the Netherlands, with its short distances, this had led to almost unprecedented delays and a general slowing down of public life. 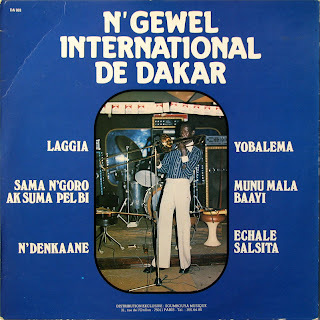 This seems the right time to share this marvel of Senegalese music by N'Gewel International de Dakar with you. I copied a cassette version of this album sometime in the 1980s, and was lucky enough to find the lp a few years later. I am telling you this, because I only realised I had not messed up when copying the cassette when I listened the record. I had been under the impression that I had erroneously turned up the volume after 2'36 in the first track. But this proved to be a 'feature' of this record (the same feature can be found in the track "Munu Mala Baayi" on the B-side, by the way). Unfortunately I can't tell you very much about the group. I met percussionist Farba Sene when he performed with Alou Fané's group Fotemocoba. He appeared to have happy memories of this lp, because he glowed when he saw it in my collection. In the photo on the backside of the sleeve he is sitting at the back on the right. But as is often the case, the music speaks for itself. The lp contains three brilliant ballads, including a classic version "Yobalema", and three more uptempo tracks, including a crisp version the Ahijados song "Echale Salsita".